Celebrate spring with Baseball! Enjoy a special rate that includes a cold beer (with ID) or beverage! Columbia Alumni will meet up at a pregame happy hour and will all be seated together as a group. Great opportunity to hang out like the good old days in NYC! • On game day please meet the ColumbiaDC board member Eun Joo Yi at the Right Field gate between 2:00-3:00 pm to get your ticket/s. Her contact is listed below. RF gate is located on first street, about 200 feet from the Will Call booths. Happy Hour at the Miller Lite Scoreboard Walk bar features $6 beers before the game. 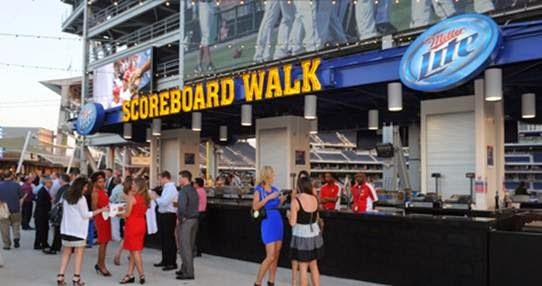 This pregame happy hour is held at the Miller Lite Scoreboard Walk bar prior to the game and until the first pitch. The Miller Lite Scoreboard Walk opens 1 ½ hours before game time on Thursdays and 2 ½ hours before game time on Fridays & Saturdays. In the event of a rain delayed start, happy hour will end two and a half hours after the ballpark gates open. Each Miller Lite Party Night ticket pack purchased includes the choice of 1 Coca-Cola product, Dasani water or beer (with valid ID). Please proceed to the Miller Lite Scoreboard Walk Bar, and present your ticket at the register where the barcode of your ticket will be scanned for verification of redemption. Drinks can only be redeemed at the Miller Lite Scoreboard Walk bar on day of game. Must be over 21 to redeem for beer and valid ID is required. Alcohol sales in Nationals Park cease at the end of the 7th inning. The Miller Lite Scoreboard Walk bar is located behind sections 240-243.